First sample is a quite interesting Springbank. If you haven’t tasted yet anything from this distillery do yourself a favour and get they 12yo Cask strength or their 10 years old. Nose (90): more than average. honey, citrus, peat, cinnamon, spices, toffee, floral. Palate (92): powerful, oily. honey, citrus, wood, spices, candies, cinnamon. Finish (91): longer than average. honey, spices. So based on other whiskies I have already tasted I rate this Springbank 18yo 1996 Burns Malt #491 with 91 points over 100. Nose (89): more than average. honey, citrus, wood, floral, vanilla, spices. Palate (90): powerful, oily. honey, citrus, spices, cinnamon, wood, smoke, pepper. So based on other whiskies I have already tasted I rate this Tobermory 20yo 1994 Burns Malt #188063 with 90 points over 100. Another distillery that is really under my radar… I have tasted a few of them and all are fantastic, so let’s see what we have here. Nose (89): more than average. honey, citrus, vanilla, spices, pinneapple, peaches, wood, meat. Palate (92): powerful, oily. honey, wood, spices, cinnamon, citrus, spices, tobacco. Finish (92): longer than average. honey, spices, tobacco. So based on other whiskies I have already tasted I rate this Linkwood 24yo 1990 Burns Malt #3540 with 91 points over 100. And at last a 26 years old Littlemill, a Lowland closed and lost distillery that has a lovely profile. I have tasted several of them and they are always a great experience and definitively if Hunter Laing chose it for bottling for their Old & Rare Platinum range, it must be stunning. Nose (91): more than average. honey, spices, citrus, flowers, candies, pears. Palate (91): powerful, oily. honey, wood, spices, citrus, vanilla, liquorice, ginger, cinnamon. Finish (91): longer than average. honey, spices, citrus. So based on other whiskies I have already tasted I rate this Littlemill 26yo 1988 Burns Malt Old Rare Platinium Hunter Laing with 91 points over 100. 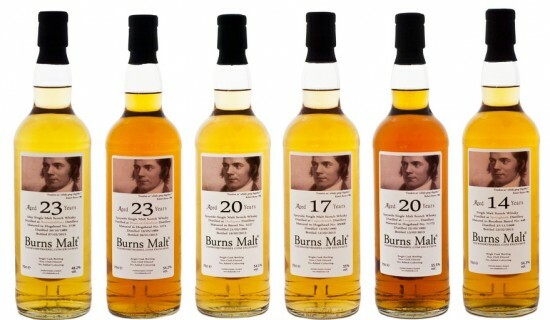 A fantastic set of additions to the Burns Malt with prices that makes you really consider them. Even the Littlemill 26 years is a bit over £250 and it is pretty reasonable for a single cask whisky from a lost distillery when you see 18 years old whiskies that goes over £100.